Portobello Personalized Address Plaque - - our only rectangle sign with a distinctive mushroom shape top. Made in USA. 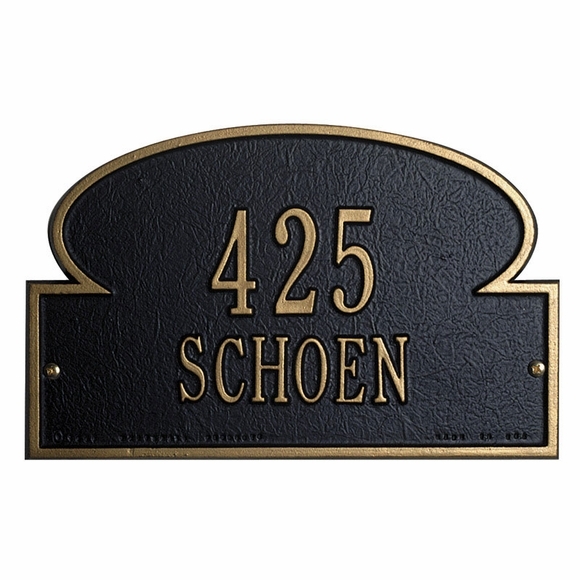 Wall mount address plaque is made to order in your choice of 16 color combinations and up to two lines of personalization. The one-line version holds up to six 2" characters. The two-line version holds up to six 2" characters on Line 1 and twelve 1.25" characters on Line 2. Colors: AB antique brass; AC antique copper; BG black with gold characters; BS black with silver characters; BW black with white characters; GG green with gold characters; OB oil rubbed bronze; OG bronze with gold characters; PS pewter with silver characters; RG red with gold characters; and WG white with gold characters.>OG bronze with gold characters; TI taupe with ivory characters; PS pewter with silver characters. Unique mushroom top personalized address plaque.